proudly from the walls. I shall never surrender nor retreat: then I call on you, in the name of liberty, of patriotism, and of every thing dear to the American character, to come to our aid, with all possible despatch. 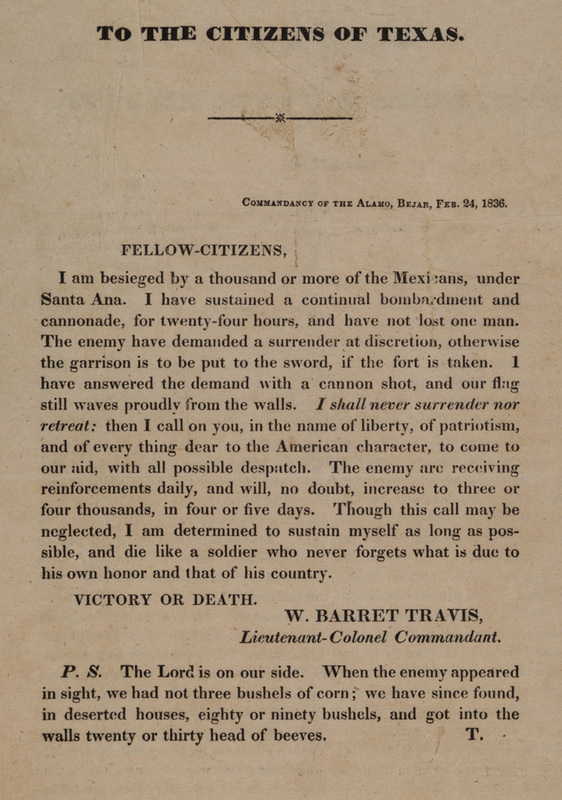 Travis’s letter reached San Felipe on Saturday morning, February 27. There, a committee of safety called for reinforcements to relieve San Antonio. 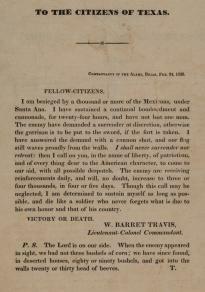 Joseph Baker printed 300 copies of Travis’s letter for distribution. On March 2, the same day Texas declared its independence from Mexico, thirty-two volunteers advanced through enemy lines to help defend the Alamo. Four days later, Mexican forces stormed the garrison from all sides. Travis and his men were able to beat back two assaults, but at last the Mexicans breached the walls of the Alamo and killed all of the Texas defenders. News of Santa Anna’s victory spread quickly through Texas, and “Remember the Alamo” became the battle cry that soon led Texas to victory at San Jacinto on April 21.